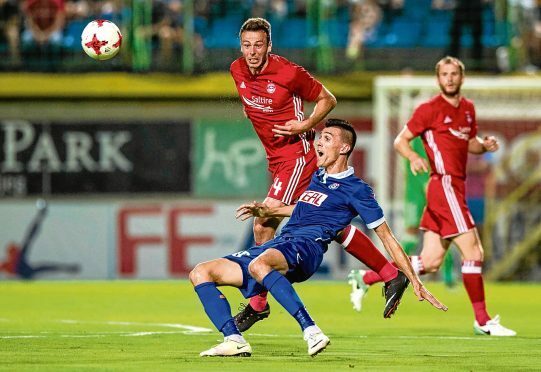 Aberdeen's Andrew Considine (left) in Europa League action. Aberdeen will face Turkish side Istanbul Basaksehir should they get past Burnley in the Europa League. The Dons were handed the potential trip to face the team who finished third in last season’s Turkish Super Lig, in the third qualifying round. The first leg would take place at the Fatih Terim Stadium on Thursday August 9, with the return leg at Pittodrie a week later. Burnley travel north to the Granite City this Thursday for the first leg of their second qualifying round tie. The second leg takes place at Turf Moor on Thursday August 2.